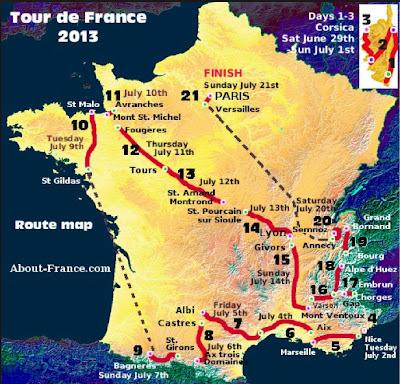 The Tour de France begins this Saturday and for anyone claiming they cannot eke out even a brief moment in time to peek in on the race over the next 3 weeks, or that doping has forever damaged their view of this Grand Tour - I say, fine. An estimated 3.499999 billion other people will be there to cover your absence by viewing this event; 11.999999 million other people will take your place curbside to watch this race live in person. That is a nice way of saying "The race will go on" with or without you. Thank goodness, because I love the Tour de France. Anything that has hung around since 1903 deserves some respect. The Tour de France is a tradition which never becomes stale, it adapts and changes and will be around for a long time to come. Evident by the fact that a race called the Grand Boucle (Word of the Day at the TDF: Boucle) in no way resembles a circle loop, and that seems perfectly okay with just about everyone. It is a sporting game afterall! This year's route zigs and zags all over the fine country of France as if it were a tourist on a 9-day all-inclusive tour of the French countryside without a map, finally finding Paris on the last day. Stage 1-3 - We are on the French island of Corsica (which is not part of Italy) for the first time in Tour history. Napoléon Bonaparte was born on Corscia. Which reminds me that I cannot look at a tiny cobbled lane or a plane tree in France without thinking of Napoléon (Tour Travel - Tour de France, Stage 11). Stage 4 - We cross the Ligurian Sea (not the Mediterranean Sea) for the Team Time Trial in Nice. Time to appreciate the pageantry and the time gaps a TTT creates. Stage 5-7 - We are skipping across the Côte d'Azur and Provence which should highlight the tourist epicenter of the universe. Stage 8-9 - We head south into the Pyrenees and straight west over any mountain that crosses our path plus a few which do not just because it is week number two of the TDF and the point is to start tiring somebody out of contention. This year the Tour doesn't even touch the slopes of the Col du Tourmalet, which is a shame, but also quite good luck since horrendous floods have wiped out the road. Rest Day - They call it a "rest day" but really it is a "travel day" because the next stage starts way up in the northwest corner of France. Stage 10-11 - We're in the northwest of France now so that the riders can complete an ITT with a finish in Mont-Saint-Michel - for photo ops. At least I am pretty sure that is why we came all the way up north. Stage 12-15 - Time to ride back across the entire country and through some vineyards and by some chateaus into the huge city of Lyon and all the way back to Provence (well technically the Vaucluse) and ride up Mont Ventoux, which was a few kilometers away from Stage 6 just 10 days ago prior to the photo op. Rest Day - On paper this looks like a "rest day," yet because the riders rode 242.5 km yesterday and will have to ride 168km tomorrow, they will certainly be out riding the roads in Vaucluse on this "recovery day". 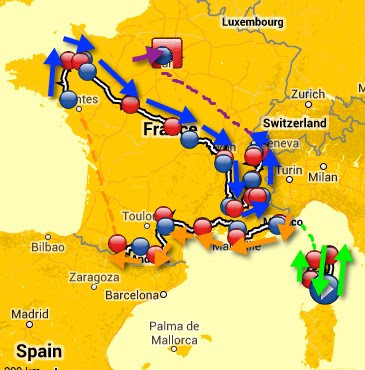 Stage 16-18 - Now we spend a couple days to ride all the way up to the Alps. Throw in an ITT, and then ride up Alpe d'Huez not once, but twice! This is also the day that the French Senate anti-doping commission will release their statement on findings. Unusual timing. Stage 19-20 - We'll get to see some of the most beautiful terrain imaginable on a bicycle as the race covers the Grand Bornand and comes really close to Switzerland to add a couple more million fans into the mix, even though Fabian Cancellara is not riding this year! Stage 21 - The Stage will start in opulent style in the gardens of the Château de Versailles and end in opulent style in the evening on the Champs-Élysées. With a big party or parade expected since it is the 100th Tour de France and they have all that printed material, costumes and props to reuse from 2003 when it was the 100th year of the TDF. This year for the 100th Tour de France it will be all France all the time. There will be no going outside the country's border for this edition of the Tour. Although it is unlikely that a Frenchman will win, the French people admire true hardship and endurance in any athlete. Supposedly they seriously do not care about the nationality of the winner, except that only French riders get airtime on French TV, even if they are in 175th place. But now that Vinokourov has retired, I am willing to act like The only thing that matters is that the best man wins. There is something thrilling about watching the grueling schedule of the Tour de France and seeing the direct affects it has on everyone. And I mean every one. The race is torturous and that is exactly what makes it such great entertainment. As fans, I predict we will spend the first 6 stages watching for crashes. By Stage 8 the teams will have to remember which riders have abandoned and stop calling them back to pick up more water bottles for the guys at the front; as fans will be left to adjust our fantasy teams. By Stage 9 the Bike Tour Companies will be lucky to have all their clients accounted for after a very brief visit to the Pyrenees. By Stage 11 we should have a good idea of who might take the General Classification, but more importantly which team cars get priority in the massive line-up of vehicles into Lyon. By Stage 14 the journalists will begin to forget where they are and which stage they are reporting on. By Stage 15 the Caravan staff, who have been partying for 2-weeks straight with long hours in the sun out on the road, will be so exhausted it is clear why there is good reason to strap them onto those "floats," especially going up Mont Ventoux. By Stage 16 everyone is really tired of eating croissants and filling up the car with diesel but we have finally made it into the Alps. By Stage 17 don't be so sure you know who the top three are after the ITT because tomorrow a double dose of Alpe d'Huez is on the menu. By Stage 18 every rider will have to dig deep to make it to the top of Alpe'd'Huez or miss the cut-off time and lose their chance to spin the pedals three days later in glory over the cobbles of the Champs Elysees. This is not the day to go home! Stage 19 is hard hard hard. By Stage 20 we'll know the winner after a final brutal day of climbing and a long transfer sure to guarantee a funny walk onto the podium after the final 133.5 km long "ceremonial ride" into Paris. Velo News has rights to publish the official guide to the TDF on U.S. soil and today online they released these super impressive facts - read: 100th Tour de France, by the numbers for lots more facts. The race is broadcast in 190 countries on 60 live broadcast channels (proof why I still end up watching the race online with annoying ads). There are 925,000 fans on Facebook, and 800,000 related apps for download on the Tour de France (0.86 app per FB fan). While the official letour.com website had 11.5 million unique visitors, in one month, last July (proof that websites rock!). Stage Date Day’s route (towns, regions) and terrain Length in Km.